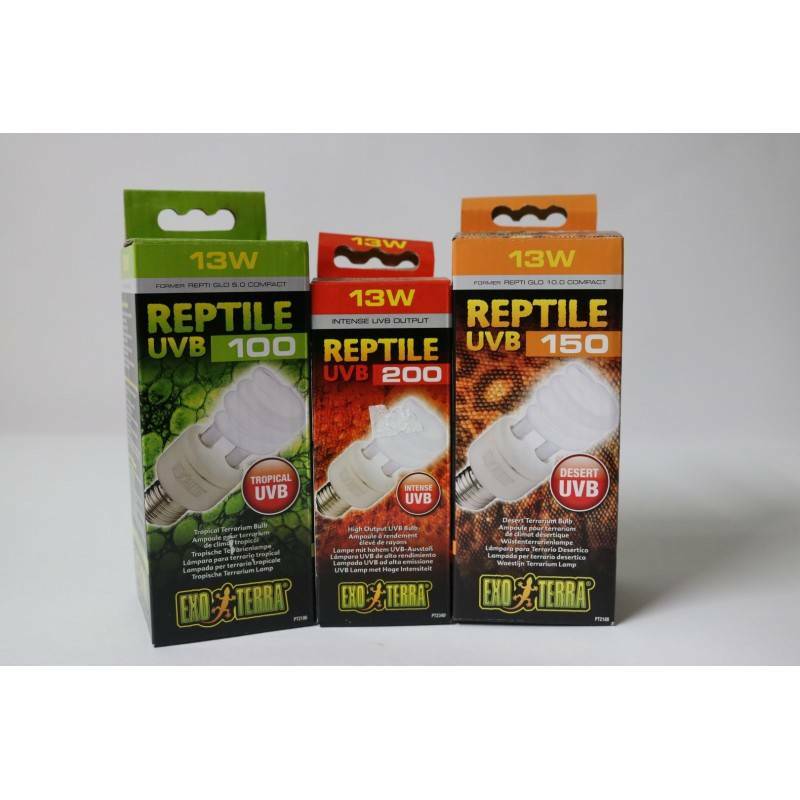 BLOGS - Getting to know Reptile Bulbs - Rick's Pet Stores Inc.
We get loads of questions about how to choose the right reptile light bulbs. 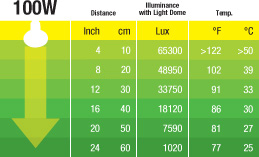 Here is a little info to help you confidently choose your next bulb! Different species of reptile have different lighting requirements. For instance bearded dragons are typically diurnal, meaning active during the day, so heat and high spectrum light is important to their functioning. Leopard Geckos on the other hand are typically nocturnal, meaning that they are active mostly at night, so they require a daylight period to regulate their metabolism, but it is not necessary for it to be as intense. Get to know your reptile and the kind of environment it prefers. To choose the right bulb there are a few factors to consider. The amount of heat it can produce, the intensity, beam spread and the spectrum of the bulb. 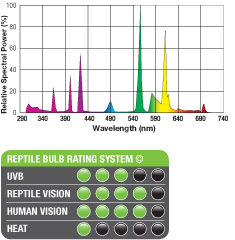 Most reptile bulbs come with handy charts on the side of their cartons that will give you this information. This one shows you the temperature of the bulb at various heights. 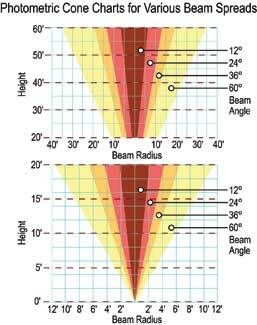 The beam spread refers to angle of the opening where light can exit the bulb. The narrower the opening the hotter and more intense the light will be, but will cover a much smaller area. When the opening is wide the light will be more diffused and cooler, but will cover a greater area. Getting the right fixture for your bulb is, also, important. Light fixtures are rated in watts. The rating is the maximum draw that the fixture can tolerate. It is important to get a fixture that has a Watt rating that is greater then the bulb you will be using, if the bulb matches or is greater it can damage the fixture, which in turn can cause bulbs to burn out prematurely. Domes can, also have different shapes and coatings to help direct heat and light. You will find that some domes are coated with a shiny interior, these are primarily used for UVB bulbs because the shiny coating will actually redirect the UV rays back in the tank allowing for better UVB coverage in the tank. Heat fixtures will usually have a white or glow in the dark coating inside. The white is ideal for reflecting heat back into the tank. Here are a selection of the bulbs we carry at Rick's. 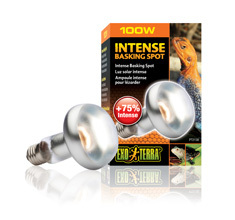 The Intense Basking Spot is designed to create a relatively small area of intense heating, as well as, provide visible spectrum light for the daytime terrarium cycle. It does this by having a reflective interior coating that funnels the light rays through a small opening. It can stimulate activity in reptiles trough its production of UVA rays, but does not produce UVB needed for metabolic functions. It is ideal reptiles that prefer dessert conditions. It has a 45º beam spread. The Daylight Basking Spot is designed to a broad spectrum light that can create heat over a wide spread area for thermo regulation. 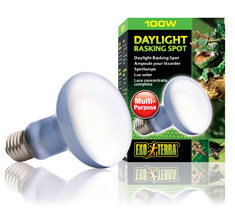 The Daylight basking spot has an ideal spectrum for plant photosynthesis making it ideal for terrariums and paludariums with live plants. It can stimulate activity in reptiles trough its production of UVA rays, but does not produce UVB needed for metabolic functions. It has a 65º beam spread. 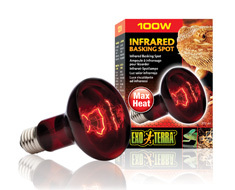 Infrared bulbs are used primarily for the production of heat during the night cycle in a terrarium. The red light is low in the human and reptile visible spectrum so it will not interrupt the natural night cycle. It is ideally used for nocturnal reptiles like leopard geckos because, it allows the reptile to experience a night cycle while still offer enough light that their owner may view their activities. For Diurnal reptiles where night viewing isn't necessary other heat sources can be used in its place. 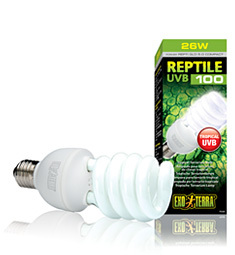 UVB bulbs are probably the most critical bulb for good reptile husbandry. UVB is absorbed through the eyes and skin and causes Vitamin B Photosynthesis which is integral in proper calcium absorption. Calcium is important for the production of teethe, bones, claws and scales. Providing adequate UVB can prevent a whole host of metabolic diseases in reptiles.